Wilton Manors Precast Concrete Scuppers that are reasonably priced are available from our team of experts at Atlantic Coast Precast. We will make you our top priority, and will work hard to meet your needs. We aim for 100% customer satisfaction, and will do everything we can to exceed your expectations. Avoid foundation damage and soil erosion by using our concrete scuppers to redirect rainfall away from your building. You will be very pleased with the final outcome! Call our team of experts today for more information! Wilton Manors our Precast Concrete Scuppers are vital in helping to manage rainwater. Our blocks are available in various sizes to accommodate your individual needs. If you don't see any that you like, our experts will customize them for you. Our precast concrete scuppers are a favorite among designers, engineers, architects, contractors, and other industry professionals. They can make any space more attractive and functional, so do not hesitate to contact us. Since starting our business in 1965 we've gained an excellent reputation! You not regret purchasing your precast concrete scuppers from us! 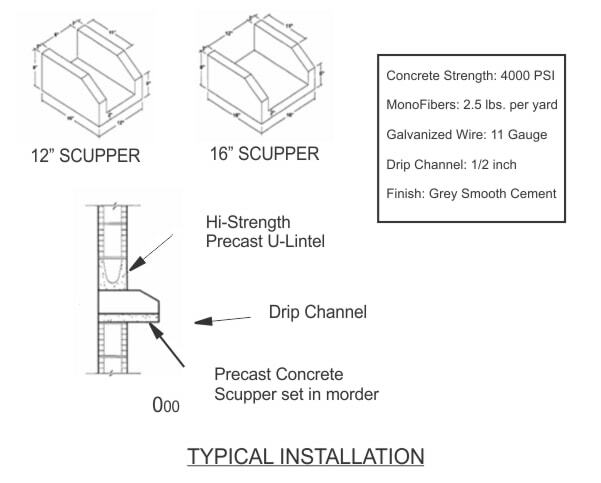 Wilton Manors Precast Concrete Scuppers from Atlantic Coast Precast is made from a durable precast material that is designed to last a longer time. It can be customized into any size or shape you would like, and is able to withstand a large volume of water at one time. Whether you need small blocks or large ones, we got the right one for you. To discuss your specific needs, call us at your earliest convenience. We will give you a free estimate when you contact us! We look forward to hearing from you!